Direct from the builder. 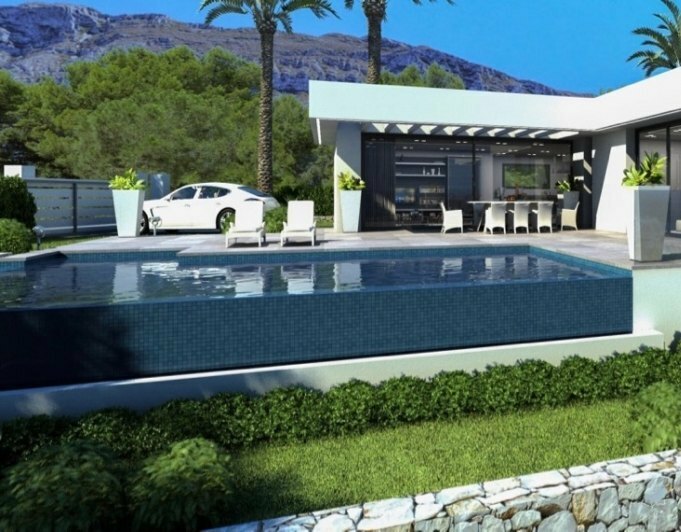 Newly built villa for sale in modern style in Dénia on the Costa Blanca in Alicante of 237 m2 built on a plot of 801 m2 of new construction, in one of the best areas of Dénia Marquesa VI just 2km from the sea and city center. Finished estimated Summer 2019.Distributed in 2 floors plus basement:Low level. 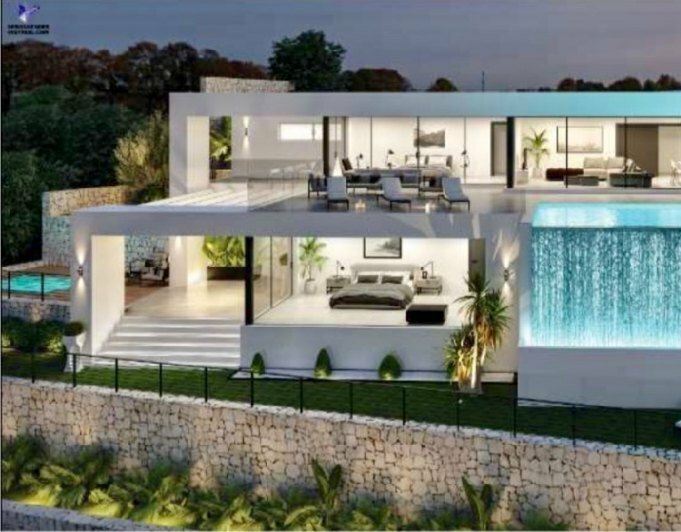 It is distributed in entrance hall, closed kitchen and laundry, living room with access to the porch, terrace and pool (9.5 x 4). 1 toilet. 1 bedroom with bathroom en suite. This bedroom also has access to the pool terrace.Top floor. It consists of 2 double bedrooms with bathrooms en suite. The master bedroom has access to a private terrace from which you can enjoy views of the sea. Basement apartment: Garage and diaphanous area of ​​70 m2Abroad. pool of 9, 5 x 4. 1, BBQ, summer kitchen, terrace around it, outdoor shower and garden areas easy maintenance. Parking on plot.Among its equipment, it has electric central heating with a heat pump with digital thermostats on each floor of the house with an aerothermal system (underfloor heating). Installation of air conditioning in living room and bedrooms through conduits of the brand LG ELECTRONIC. Double glazing. Enclosure of plot with walls of blocks and fences of galvanized iron. Electric pedestrian door with videodoorman. Automatic sliding door for car entrances, access ramp to the house. Outside barbecue, summer kitchen. Installation of water and light connection points for the garden, armored door, Pre installation of ElevatorIncludes:Water pipes and water meter for the house.Waste or sewage pipelinesOutdoor electrical box for the houseWalls for the preparation and containment of the plotTaxes for licenses, building permitsProject, fees Architect and Technical Architect.Visa of the College of ArchitectsTopographic studyGeotechnical projectQuality controls of concrete samplesDeclaration of New WorkDecennial InsuranceFirst Occupancy Certificate of Occupancy Dénia, next to Oliva and Jávea, is a cosmopolitan and modern city located north of the Costa Blanca. Touristically it is a destination of the most valued of the Mediterranean sea for the high quality of its services and products.Dénia is one of the most exclusive and pleasant places to buy your home on the Costa Blanca.Denia has 20 km of beaches, to the north, Punta del Raset, Les Marines, Les Bovetes, Els Molins, L'Almadrava (boulder) and Les Deveses. To the south, La Marineta Casiana and small coves with places of great beauty, El Trampolí, Punta Negra, Arenetes and La Cala. Dénia, is very involved with its sea due to the fishing activity, whose most significant product is the famous red shrimp of Denia.Marinas, Marina de Denia, Marina El Portet de Denia, Denia Yacht Club and the commercial port, Puerto de Denia, with the presence of charter companies that travel to the Balearic Islands (Ibiza, Mallorca, Formentera).